I wanted to share one more Christmas card! I made a few of these to send to my special friends! My poinsettia was too large to put the sentiment beside it, so I had to position it a little lower than the sketch called for. 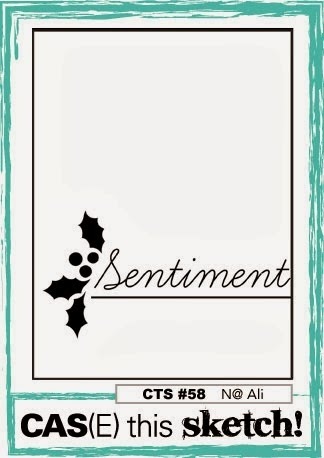 This gorgeous poinsettia is from Stampin Up. I just love it! I stamped it on vellum card stock with Versamark ink. Then heat embossed with SU silver embossing powder! I took a blade and cut out the center leaves and lifted them up. I used some silver Liquid Pearls for the stamens. All of the stamp and papers are from Stampin Up! The tinsel is Tim Holtz. STUNNING card Mackie!! Love the silver and soft aqua together. Have a great weekend! Gorgeous card Mackie! Love that stunning Poinsettia and fancy silver trim! SUPER stunning, mouth dropping!!! LOVE this!!! Oh, how pretty Mackie. Love the silver embossed poinsettia! Very elegant. This is stunning, Mackie! I do love aqua and white and silver together for Christmas. You always make the most breathtaking cards, Mackie! You should be on every Design Team there is with your eye for design and your impeccable execution! Your poinsettia is just STUNNING, Mackie! LOVE!